(Updated August 1, 2018) Do your firm’s communications suffer from capitalization creep? It’s an insidious virus that infects the writing of many a professional — lawyers chief among them — resulting in an over abundance of capitalized words on a page. Legal writing encourages this behavior of capitalizing words as a way to personify or make them formal subjects of a document. Writers will often capitalize a word to give it extra importance. But don’t allow that logic to creep into your marketing writing. A style guide is helpful not only to keep everyone on the same page using consistent style, but it is also great support when you need to tell a specific attorney why you keep lower-casing his or her capitalized terms. It can sometimes be difficult especially for a younger professional to tell a senior attorney that his “Fellow” should be a “fellow” or that her “Chair” should be a “chair.” However, a nicely worded e-mail stating that you’ve made the following edits to the article “to maintain consistency with the rest of the web site and to adhere to AP style” almost always gets your point across and accepted. Another good reason to limit capitalization: It’s much easier to read a sentence or paragraph that isn’t fraught with capitalized words. Lots of capitalized words make a paragraph clunky and slow down reading. One big trouble area especially when preparing attorney bios is titles. Formal titles are capitalized when used immediately before a name, not when they are used alone or separated from the name by commas. He is Chairman of the Board of Directors of Brown Company. Mary is Editor in Chief of the Technology News Quarterly, and a Contributing Writer to several IP Newsletters. He has a Bachelor of Arts degree in Ceramics and a Master of Science degree in Chemistry. He has a B.A. in ceramics and an M.S. in chemistry. Capitalization is just one battle you will win armed with the AP Stylebook. It’s a great reference for any communicator and solves any moments of indecision you may encounter on the job. The Associated Press also has an online version of the guide that you can use with a site license and customize to define your firm’s or organization’s specific style preferences. 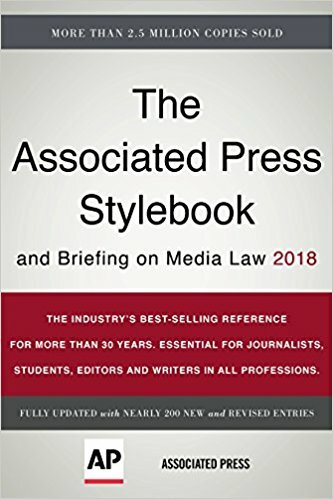 We use the AP Stylebook and I totally agree it is a valuable tool for anyone who is preparing documents. In our business we see many of the improper capitalization examples you cite. (By the way, I love your description of “de-capitating” documents!) We also encourage our clients to create a custom style guide to ensure that their documents are consistent within their organization. Thanks for the post..